• World’s End, Pablo Neruda (trans. William O’Daly). Copper Canyon Press. $15.00. 96pp. • Selected Poems: Before Saying Any of the Great Words, David Huerta (trans. Mark Schafer). Copper Canyon Press. $20.00. 400pp. • The Romantic Dogs, Roberto Bolaño (trans. Laura Healy). New Directions Press. $15.95. 128pp. In this review, we will examine the careers and writings of three of Latin America’s best poets. The first, Pablo Neruda, is from Chile and from an older generation of writers. David Huerta, from Mexico, and Roberto Bolaño, born in Chile but raised in Mexico, are both from the following generation—Huerta was born in 1949, Bolaño in 1953. Fortunately, all three have work recently published in bilingual editions, the way poetry should be presented. 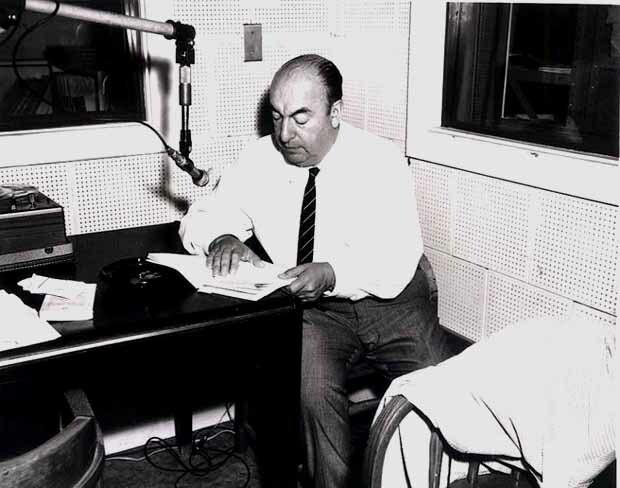 Pablo Neruda, whose given name was Neftalí Ricardo Reyes Basoalto, was born on July 12, 1904 in the town of Parral in Chile. In memory of the Czech poet Jan Neruda, he began in 1920 to use his nom de plume when submitting poetry to the literary journal Selve Austral. In 1924 he published his best-known and most translated work, Twenty Love Poems and a Song of Despair (Veinte poemas de amor y una canción desesperada). Between 1927 and 1935, he was awarded a number of honorary consulships in such places as Burma, Ceylon, Java, Singapore, Buenos Aires, Barcelona, and Madrid; it was in the last of those that he came to know Federico García Lorca, whose political murder affected him deeply. Returning to Chile in 1943, Neruda joined the Communist Party, and, elected a senator, he took a strong stance against President González Videla, who, although believed to be a populist, turned around and represented the moneyed interests of Chilean society. Neruda was forced to live in hiding for two years and concluded his career with World’s End (Fin de mundo) in 1969.
or all conversing at once. While alluding to Babel, Neruda also conveys the language of silence in a totalitarian regime. and that the coffin invites you. to gather itself in a wine glass. they dishonoured themselves in Vietnam. into the pockets of Chicago? Why go so far to kill? Why go so far to die? Neruda reaches back to Baudelaire, Rimbaud and the other Symbolist poets where the things of the senses merge into the act of creation. Is the phrase “take off my clothes” a reference to William Carlos Williams’s “Danse Russe,” and will Neruda dance naked before his own “yellow drawn shades”? the good men killed a judge. as into a small emerald sack. There is no need for legal language here, no reason for academics to write books, the simplest of language, the stark dichotomy between good and bad lets all know that no matter who the murdered, who the murderer, in the end, if revenge and reprisal become the norm, all will perish and the land will be destroyed. Note that the word evil was not used. If it had been, then a much different dynamic would have been brought into play and we would not, perhaps, have so easily accepted the message Neruda was sending. it was Huerta’s second collection, Cuaderno di noviembre (November Notebook), that established him as a bold, innovative poetic voice in Mexican letters. Comprising fifty untitled sections, Cuaderno boasted a vast lexicon in the service of a voice focused, in part, on the process of writing. Huerta’s new work rejected the Romantic and Modernist idea of the poem as a transparent form of communication transmitted by a stable “I” standing outside language, and instead embraced irony, parody, and ambiguity. At the same time, the language of Cuaderno was lush, filled with stunning imagery and, at times, overtly philosophical. songs like the stroking of narcotics. I thought of the double dream of Rrose Sélavy. saw thirst’s throne overlaid with lichen. and donned the gloves of nightmares. beasts creeping through the passageways of my ears. I was a piece of myself listening to you. This quote exemplifies Huerta’s use of sometimes very long lines, a device at play throughout this poem. Toward the surface shine the eyes that weave themselves into it with a hope of salvation, a faith of resurrected icons, of speleological lazaruses of death and burials. Toward the surface head so many images, murmurings that blackened the walls of light, testimonies of abandonment, and breaking of assorted organisms. Toward the surface, walking like a nomad off-course, the poem that longed to be written and could not get beyond the alveoli of silence, advances, shattered with fullness, luminous to the point of blinding, and filled with an appetite for the surface it will never see or touch unless it boasts the afflicted gifts of the shipwreck; the only thing that can take it on a definitive trip toward the surface. —politicians’ lies and slander, too. Here Huerta displays his recognition that words are capable of creating both beauty and despair; it is the gift of the poet to, hopefully, move toward the former and away from the latter, but the potential for both exists. This is an excellent reminder to poets to respect their art and their craft (for poetry has aspects of both). 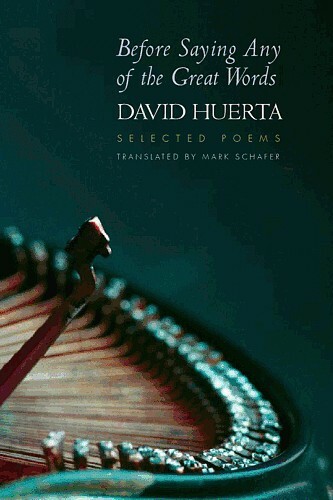 And this is also an excellent place to leave David Huerta and move on to the poet that has bridged the gap between Neruda and Huerta, between Chile and Mexico. Roberto Bolaño, who has died at Blanes in northern Spain of liver failure, aged 50, was one of the most talented and surprising of a new generation of Latin American writers. Born in the Chilean capital of Santiago [in 1953], Bolaño was typical of a generation of Latin American writers who had to cope with exile and a difficult relationship with their home country, its values and its ways of seeking accommodation with a turbulent history. Bolaño turned to literature to express these experiences, mixing autobiography, a profound knowledge of literature, and a wicked sense of humour in several novels and books of short stories that won him admirers throughout Latin America and Spain. Bolaño spent much of his adolescence with his parents in Mexico. He returned to Chile in 1972, to take part in President Allende’s attempts to bring revolutionary change to the country. Arrested for a week after the September 1973 Pinochet coup, Bolaño eventually made his way once more to Mexico, where he embarked on his literary career. At first he wrote poetry, strongly marked by Chilean surrealism and experimentalism, but after moving to Spain in 1977 he turned to prose, first in short-story form and then more ambitious novels. Whether Bolaño ever met Neruda is unknown, as he returned to Chile just before Neruda’s death. But even if he didn’t, he was certainly influenced by the surrealism of Neruda’s poetry. The same must also be said of his potential relationship and awareness of David Huerta, as he lived in Mexico in the years leading up to the publication of Huerta’s first book. As Romantic Dogs has previously been reviewed in these pages, we will just briefly touch upon the bridging of the divide of Neruda and Huerta. No matter where in Latin America one goes, there lies that cry against the injustice of brutal right-wing regimes, either those in power or those threatening to assume power and supported by the elite. One is hard-pressed to find a Latin American poet whose political stance is not left-wing. They are either members of the communist party themselves or supporters of same. We find that revolutionary spirit in Neruda and in Huerta and, now, in Bolaño. And in this essence, cast adrift within this milieu, we end.